Doug Ford has wasted little time in his first month as premier of Ontario, leaving the business community to wonder whether a “shock and awe” approach can be sustained for his full term. The newly minted Progressive Conservative leader has kicked off his tenure at Queen’s Park by moving rapidly on a number of fronts – from carbon taxes to cannabis retail – Toronto city council and more. Every move thus far appears to have been designed to fulfill campaign promises to his supporters while inflicting maximum pain on his opponents. While former political insiders say the strategy could serve Ford well for now, it could pose a problem for the rookie premier in the future. And in the meantime, his moves have injected uncertainty into the provincial economy. “[Ford is] demonstrating a certain shock and awe approach, which is a lot of action early on that is going to confound and preoccupy his critics and opponents,” said Peter Donolo, vice chairman of Hill + Knowlton Strategies Canada who previously spent two years advising the former Liberal-led provincial cabinet and served as communications director to Prime Minister Jean Chrétien in the 1990s, in a telephone interview with BNN Bloomberg. “The old adage is you can’t hit a moving target, so if [Ford] is very active on a bunch of fronts then it is very difficult for his opponents to keep up,” Donolo said. David Tsubouchi, a former member of Ontario’s provincial parliament who served as a minister in the Harris and Eves cabinets, argues the shock and awe approach is a necessary one for Ford. 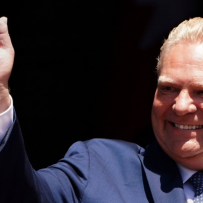 The strategy has thus far been successful at keeping his base energized and his opponents antagonized, but it has also left critical areas of the Ontario economy hanging in the balance. Ford’s plan to privatize the sale of recreational cannabis in the province – which has been widely reported but not yet confirmed by the Premier – has injected uncertainty into a sector expected to generate more than one billion dollars in annual sales in Ontario alone with barely nine weeks left before legalization takes effect in mid-October. Despite the uncertainty, Canopy Growth CEO Bruce Linton told BNN Bloomberg last week that his company could open over 100 recreational cannabis stores in Ontario ahead of the Oct.17 legalization date. Ousting the leadership team at provincial power distributor Hydro One provides another example of economic collateral damage from the Ford doctrine. Despite being among his more specific campaign promises, getting rid of CEO Mayo Schmidt and the utility’s board of directors has cut the value of Hydro One shares by more than six per cent over the past month and increased the risk factors surrounding the company’s $6.7-billion deal to buy Washington state-based utility Avista. If Ford is not careful, Hill + Knowlton’s Donolo warns the new Ontario premier could mistake the short-term success of his “shock and awe” approach as evidence that the strategy will remain effective longer-term.